Hello! 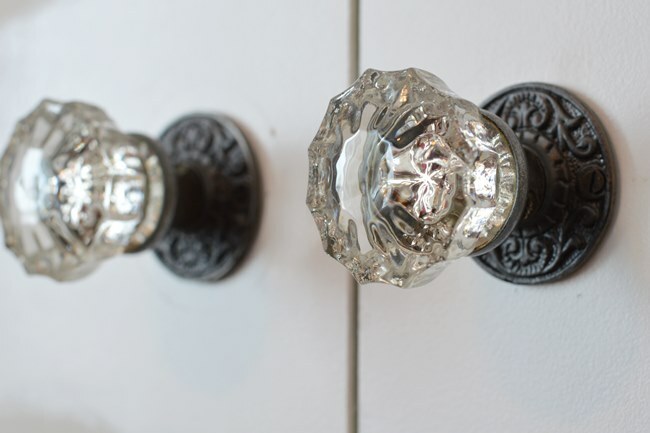 I’m Jessica and I blog about home renovations and DIY projects at The Vanderveen House. 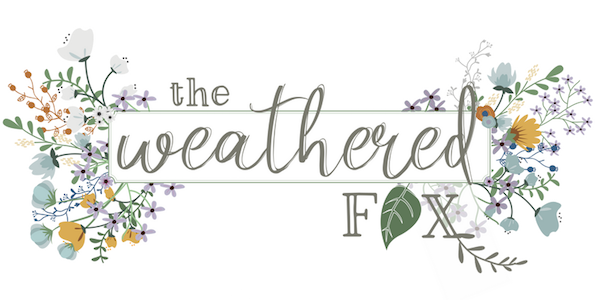 Here at The Weathered Fox I’ve shown you how to build a cedar planter, and make your own watercolor word art. 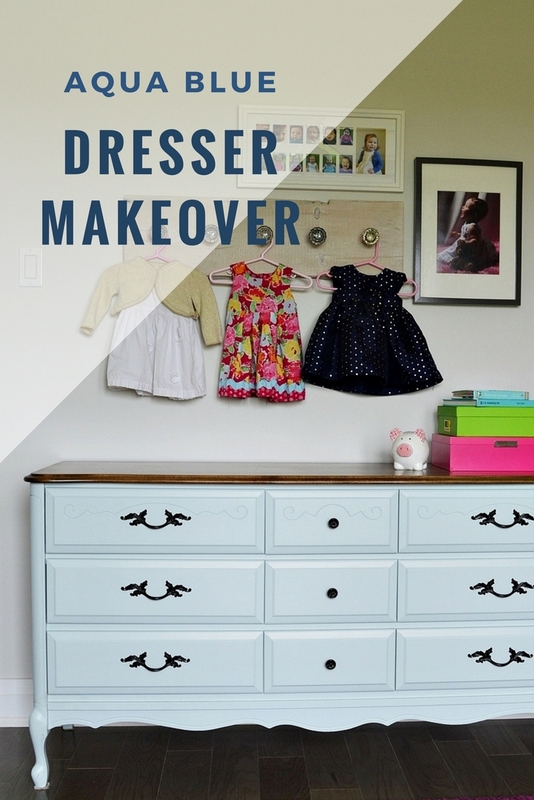 Today I’m going to show you how to recreate this beautiful aqua blue dresser makeover using a custom mix of general finishes milk paint. It’s the middle of summer, which means I’m starting to think about back-to-school for our kids. For us, that means pulling everything out of the kids drawers, packing away things that are too small, and purging anything that is no longer needed. Then I can see what the kids have and what they actually need before buying anything new. So while I had our daughter’s whole dresser empty and the clothes scattered all over the floor, I decided it would finally be a good time to refinish her dresser. 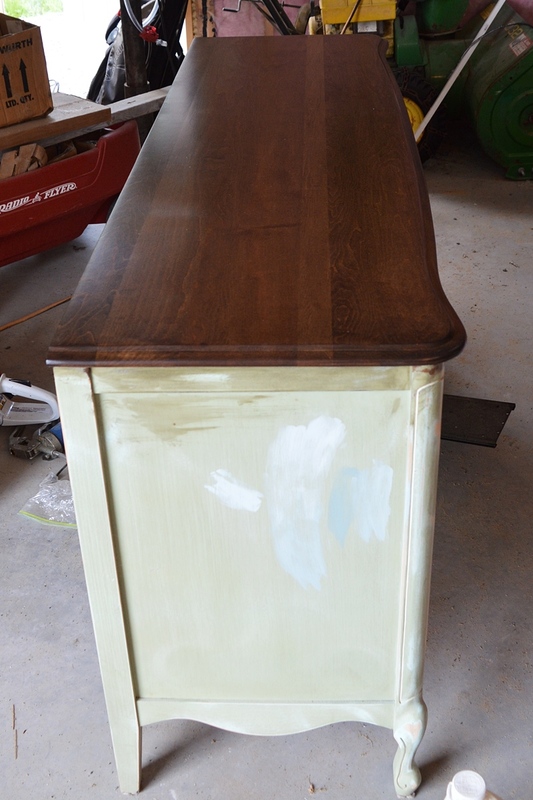 I’m going to show you how I sanded and stained the top, then painted this french provincial dresser using a custom color mix of general finishes milk paints. I bought this dresser as well as a side table for $40 several years ago. They were in great condition, other than that the top had some peeling paint. And I didn’t really love the hospital green color. The color scheme for our two daughters’ shared bedroom is mostly blues and pinks, with pops of lime green. 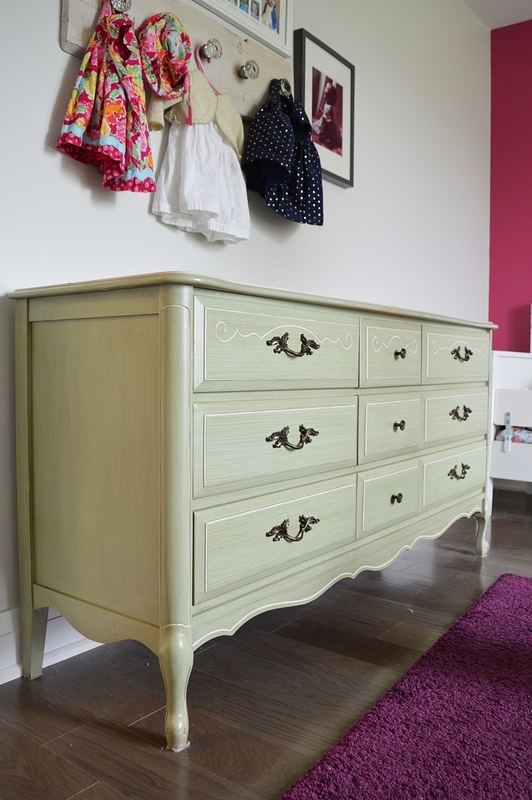 I wanted this dresser to fit in with those colors. I’m a sucker for new and different types of paint. 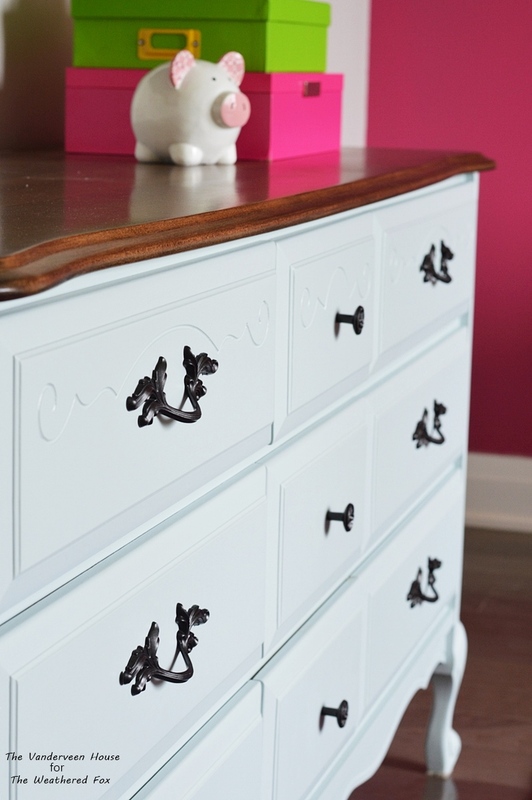 I decided to use general finishes milk paint and mix two shades to get a custom pale blue color for this french provincial dresser makeover. 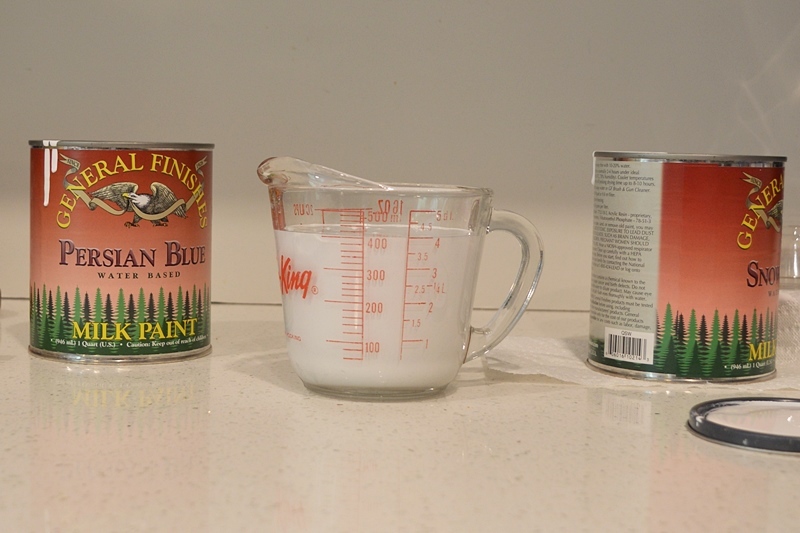 From what I read, this paint is not like other milk paints in that it doesn’t chip and peel. It’s a water-based paint that self levels and dries very hard, but you can also sand and distress it to give it a farmhouse feel. Sounds like exactly what I wanted! I had never used this paint before, but the reviews were great and I wanted to give it a try. 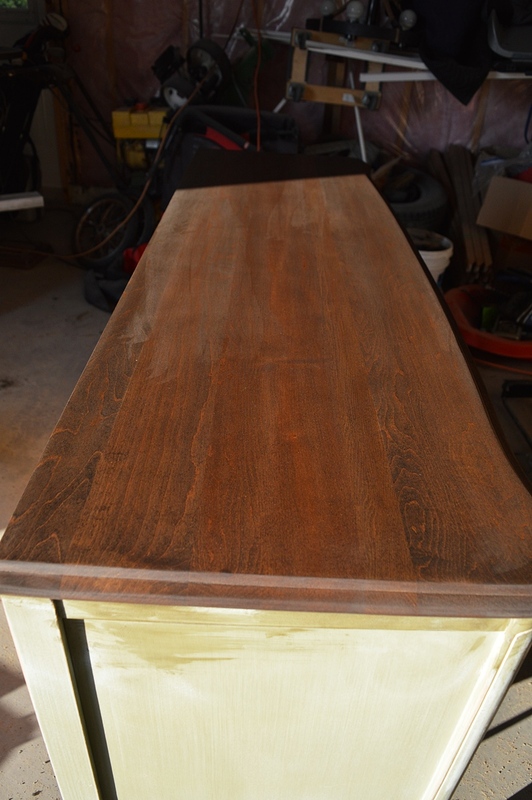 The first step to refinishing a dresser top is to remove all the old paint. 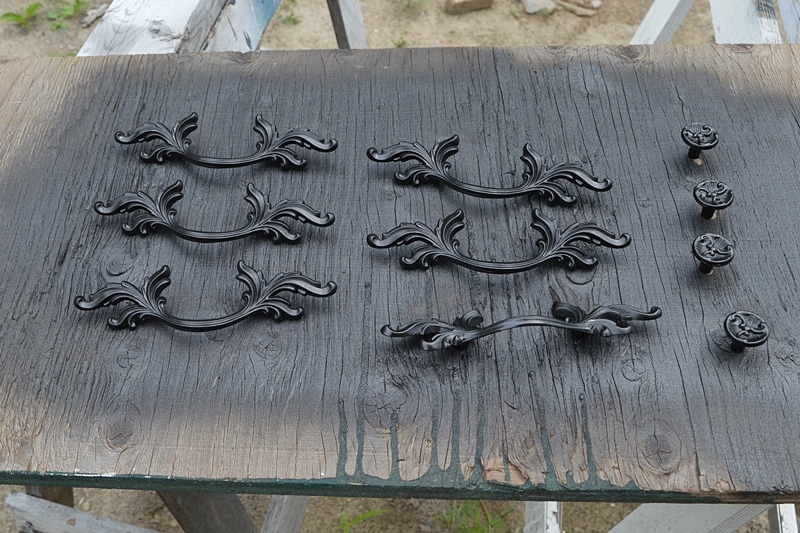 You can use paint strippers, but I prefer to sand off the old finish. 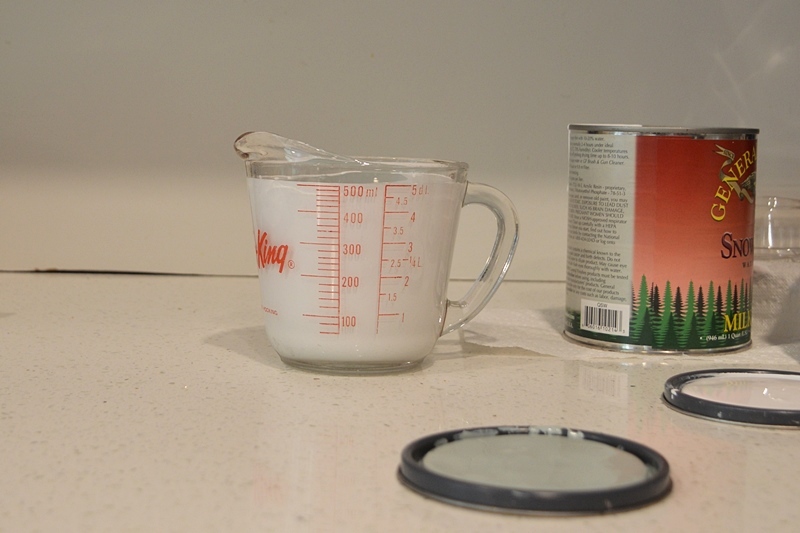 And if you’re at all in doubt about the age of the dresser, test the paint for lead before doing anything. I like to use a palm sander starting with 60 grit until most of the paint is removed. I use several different sandpaper grits, and work my way up to 180 grit for the final sand. 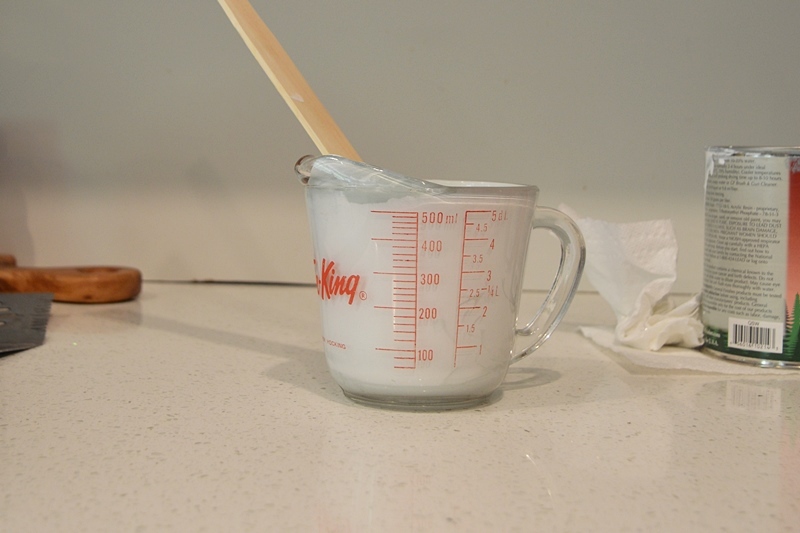 Then I wiped off any dust using a rag and used some Minwax wood conditioner before staining. I just wiped this on with a clean white rag and let it dry. Next I applied Minwax Jacobean stain using a clean white rag. Wipe it on using a circular motion to get an even coverage. Let it sit for a minute or two, then wipe it off using the same rag going with the grain of the wood. Wait a few more minutes again, and give it another wipe to make sure the stain is even. 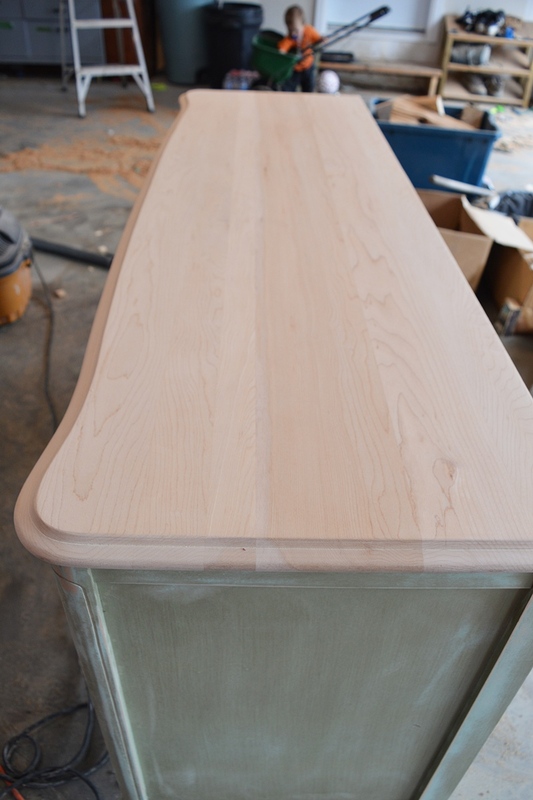 When the stain was dry, I sealed the top of the dresser using satin polyurethane. 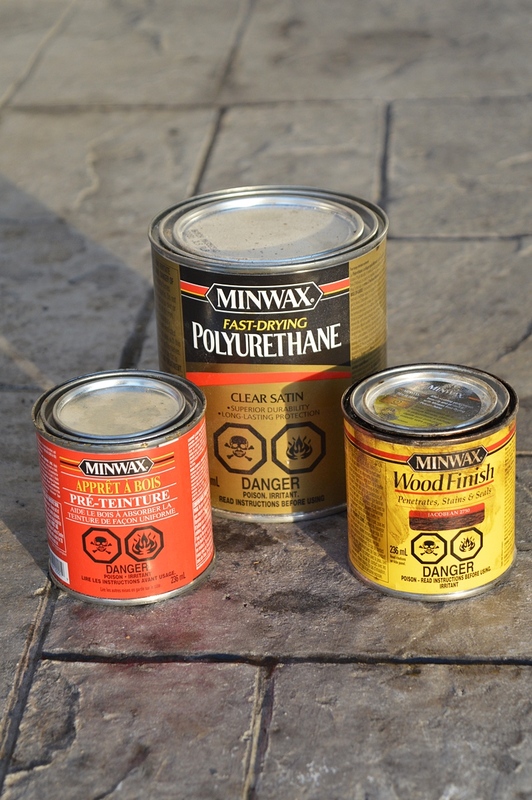 I did the first two coats using a brush, but the final coat I bought some spray can polyurethane to get a super smooth finish. 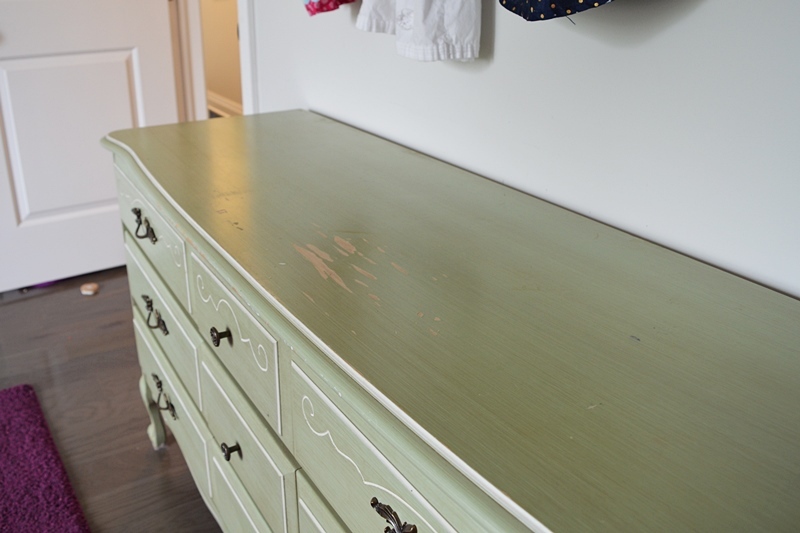 For this blue dresser makeover I wanted a very pale aqua color. I love mixing pinks and blues within a room, and thought the pale blue would contrast nicely against the hot pink accent wall. 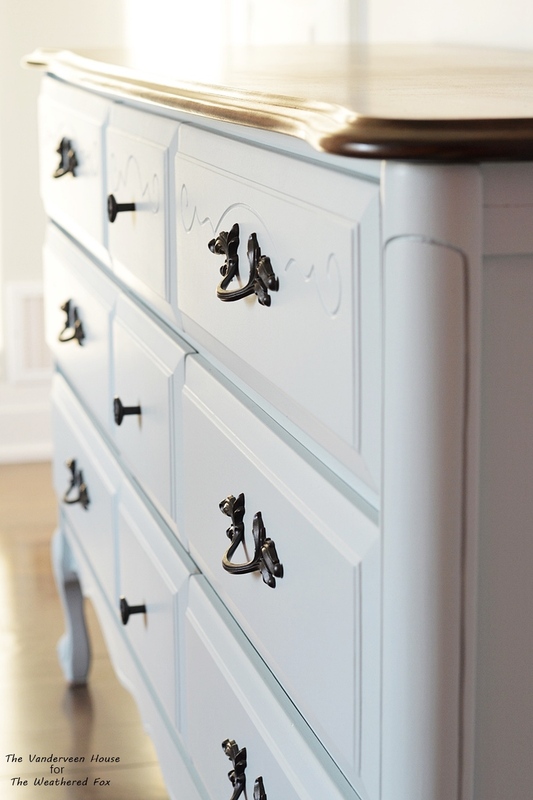 For this dresser I used a custom mix of General Finishes Persian Blue and Snow White milk paints. First I did a test color mixing up a small amount of the paint so that I could google it and see if I liked the color. 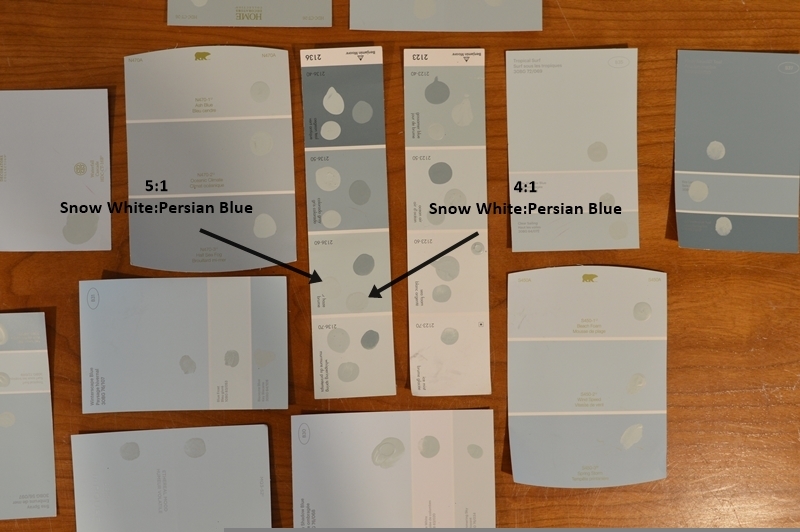 A mix of 4 parts Snow White with 1 part Persian Blue was pretty close to Benjamin Moore Harbour Haze, which is a beautiful pale blue with green/grey undertones. Just what I wanted! So then I used my measuring cup to add 4 parts Snow White, 1 part Persian Blue, and mixed it all up to get this gorgeous custom aqua blue color. I removed all the hardware on the dresser and brought the drawers inside to paint. 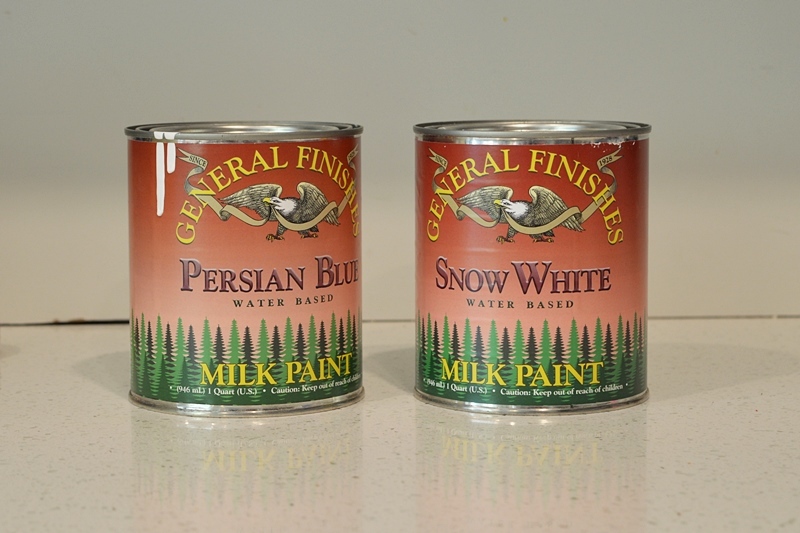 With the general finishes milk paint, you don’t have to do any prep work or priming. I always like to sand my pieces first though; it gives me peace of mind knowing that the paint will adhere better. And sanding really only takes a few extra minutes. I painted the first two coats using a paint brush. This paint covers so well that I probably didn’t need to, but I did a third coat anyways using a foam roller. 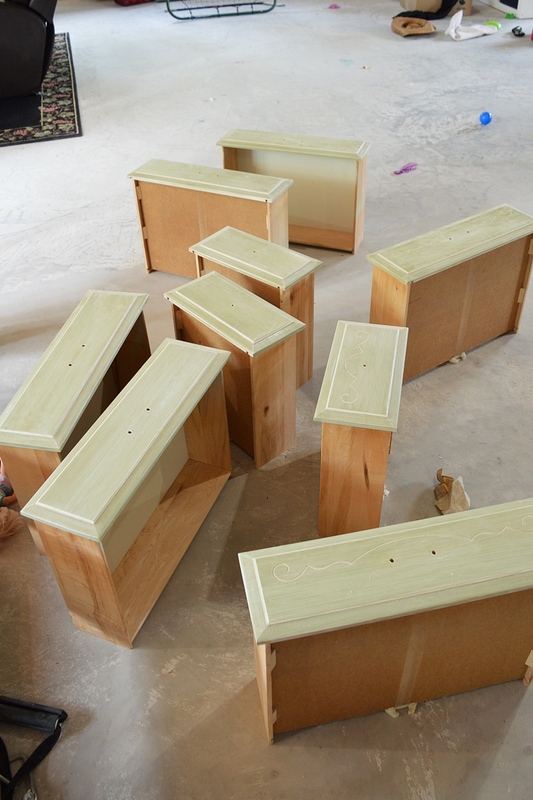 I like to sand in-between coats using 100 or 120 grit sandpaper just to remove any imperfections. 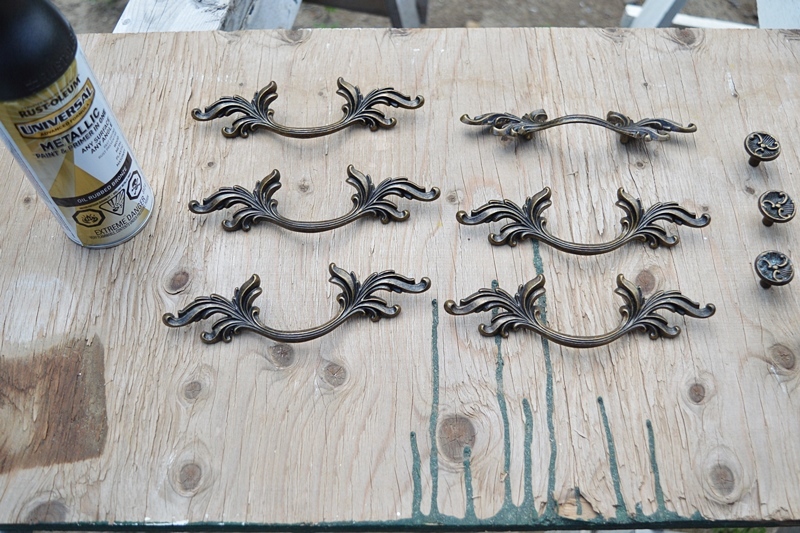 Then I also updated the hardware with some oil rubbed bronze spray paint to match the finishes in the rest of the room. 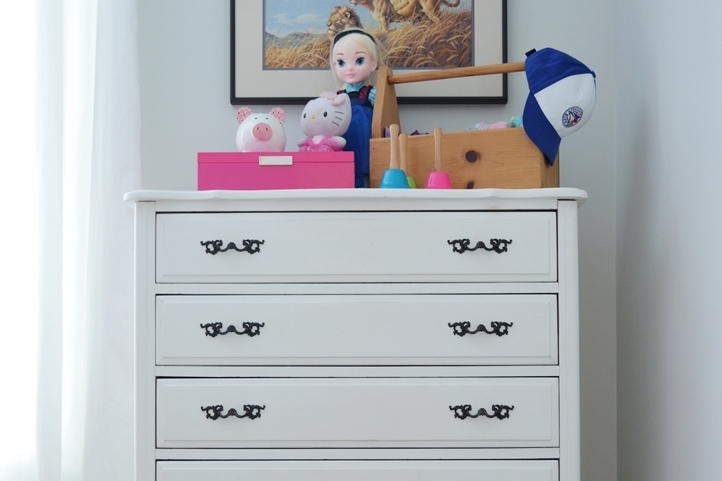 Once the paint was dry I installed the hardware, put all the drawers back in, and we moved it back into the girls’ bedroom. 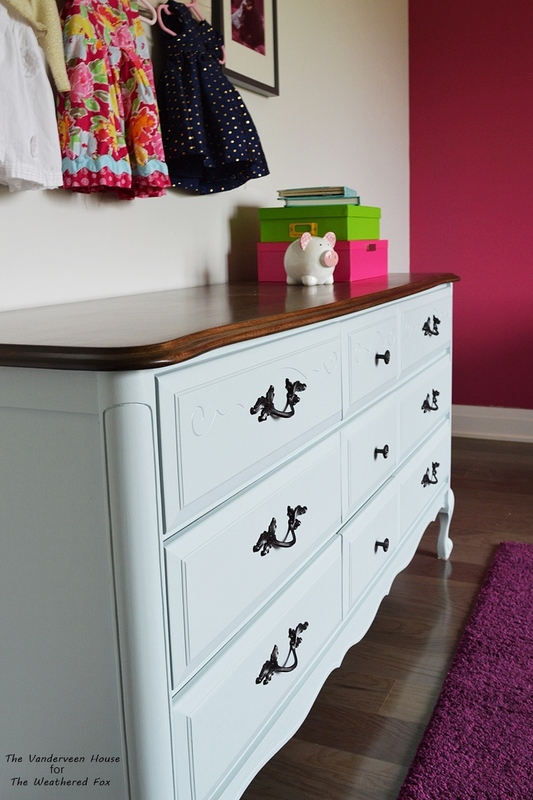 I love how this dresser turned out and I think it looks amazing in the room! I nicely folded all my daughter’s clothes that were left after purging and put them back in the drawers. We’ll see how long the nicely folded clothing lasts with a 5 year old girl who likes to change outfits multiple times a day. 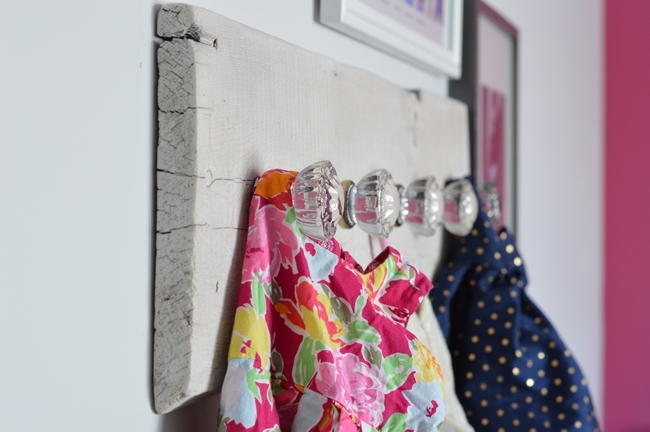 I love how the aqua blue is so calm and elegant, but still adds some color to this side of the girls’ bedroom. I think it looks lovely with the hot pink and other colorful accents. The color scheme for this bedroom was inspired by that little pink dress. Both of the girls wore that dress when they were babies and it was always one of my favorites. So that checks off another summer project from the to-do list. 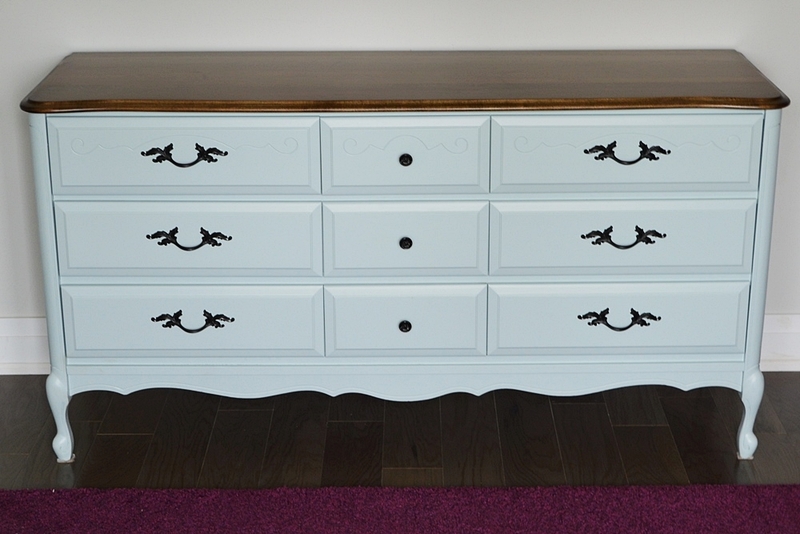 Now that I finished this pale blue dresser makeover, I can get on with some back to school shopping! I just loooove this makeover! I can’t believe the top wood looks so nice after sanding and staining. Great job! And that little black and silver polk-a-dot dress -> I bought matching ones for all my 3 girls a few years ago. It was the only all matching dresses I could find and looked so cute on all of them 🙂 . Thanks for reviving the memories!